I am a little bit obsessed with the 80's. Sometimes I even feel like every other post I write, that isn't a recipe, has something to do with the 1980's. For awhile I felt weird about that, but now I embrace it. Why? 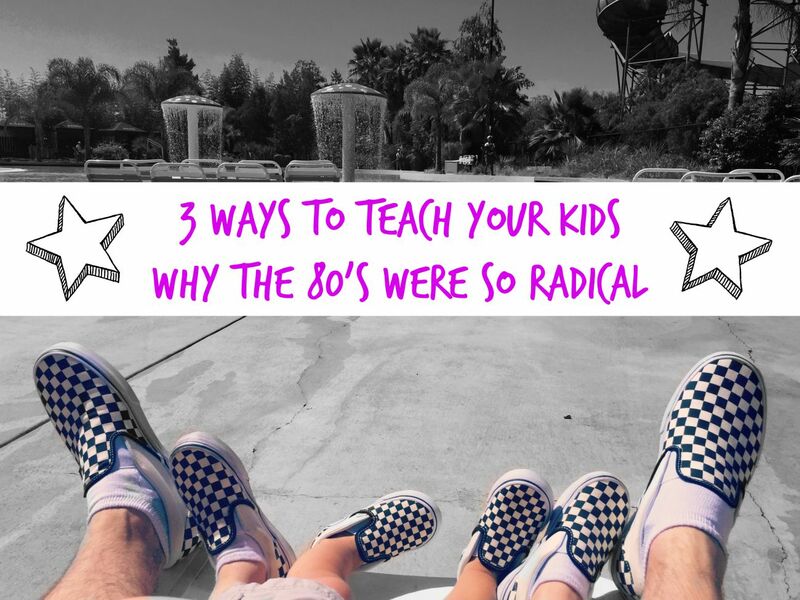 Because as a child of the 80's, I think there were some totally radical things about that decade. As a dad, and card carrying fan of the 80's, it is my right and my responsibility to help my own kids experience the great parts of the 80's. So sit back, chill, throw on some Poison or Run DMC, and listen to some ways in which you too can share the 80's experience with your children. I know authentic 80's collectibles are pretty expensive but you don't have to dive deep into your bank account to get the banging 80's toys you always wanted as a kid. I distinctly remember saving up for months for the Cobra Nightraven jet from G.I. Joe (pictured above). When my parents finally took me to the store I was devastated to find it wasn't carried there anymore. I still haven't found the Nightraven, but my kids have very much enjoyed playing with new releases of toys from Star Wars, Transformers, American Girl, etc. So get on the floor with your kids and break out the Stormtroopers, Decepticons, and Strawberry Shortcake! some of you are holding out hope that those Hypercolor t-shirts are coming back, but it's time to face the truth. However there were some amazing shoes in the 80's. Vans, Airwalks, and Nike's were always my dream shoes. Recently I discovered shoebuy.com and they sent my sons and me some shoes to try out. One of those styles was the holy grail of 80's shoes: the black and white checkerboard Vans (Cue the Hallelujah Chorus). Not only did they have them in my size, but they carried them for my 5 and 1 year olds also! In fact, last week my oldest son wore his to school and made me promise to wear mine as well. That's us in the pictures above. I also picked out some more recent styles such as the Timberland Boat Shoes and Clark's Desert Boots (my wife's favorite). So check out Shoe Buy and look for these and other styles because wearing fun matching shoes with your young kids can bring back serious 80's nostalgia, and also bring you all closer together. Earlier this year I wrote about some 80's snacks that my kids will never get to experience. Well, thankfully our culture's 80's influence knows no bounds and some of my childhood snacks are back for my kids to enjoy. Many of these snacks are not fit for everyday consumption but are tubular as a special treat. You can use these snacks to remember those righteous artificially flavored sugar rushes that got you through the day in elementary school. If you keep your eyes open in stores you can still find Shark Bites fruit snacks. It was a great snack time if your pouch included the elusive Great White Shark. You can also now get your hands on French Toast Crunch in local grocery stores. This was the more popular, and better tasting, cousin of Cinnamon Toast Crunch. I also found The Original New York Seltzer is back in some areas. When I saw this drink I literally stopped what I was doing and stared longingly while I was taken back to my childhood. Nothing screams 80's drinks like poppin' open a bottle of Black Cherry or Vanilla Cream Soda. So get your mullet trimmed up and make sure there are batteries in your Sony Walkman because some extra time reliving the 80's with your kids might be just what your family needs. After all, you are the parent and it is your influence that will introduce your kids to these finer things in life. Disclosure: Shoebuy.com sent me their products to review. I have received no other compensation for this post and the opinions I’m expressing here are solely my own.